Fri., Aug. 4, 2017, 1:52 p.m.
Toby Keith in concert, reviewed Thursday at Northern Quest Resort & Casino. 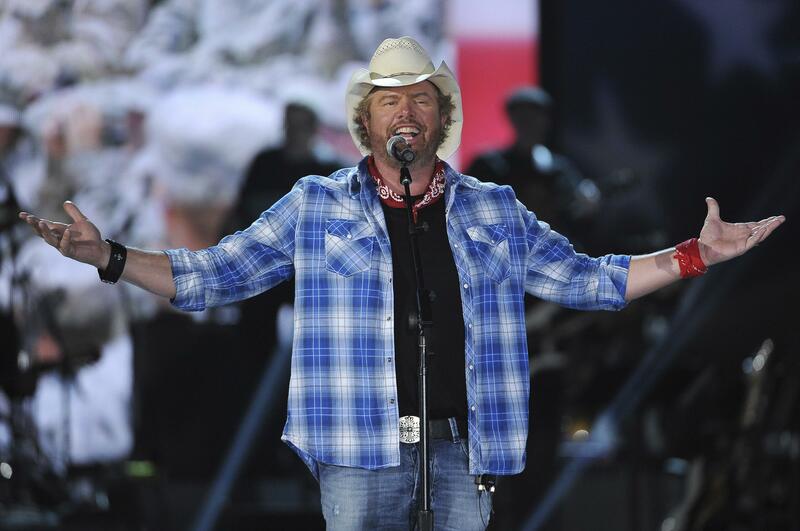 Three values prevailed in an engaging night spent with country star Toby Keith: patriotism, a deep love of booze and girls who drink it, and the importance of a redneck party. The opening to Keith’s “Interstates and Tailgates Tour” at the Northern Quest Resort & Casino in Airway Heights on Thursday night was a pleasant surprise. The Easy Money Band — complete with a rhythm guitarist, saxophonist, keyboardist, trumpeters, and trombonist — infused the night with a funky jazz sound. Keith’s performance of the hit “This American Ride” showcased his charisma and an ability to spit out meaty lyrics. The set list in a word: entertaining. Keith included a fair share of songs guaranteed to garner laughs and audience sing-alongs, including “I Love This Bar,” “Red Solo Cup,” and “Beer for My Horses.” During these performances, Keith often worked the stage and held up a glass to the audience. But his stage presence did not fully evolve until the second half of the show. His band, featuring incredible musicians delivering enthusiastic performances, initially outshined Keith, as the upbeat music called for more than singing into a microphone and strumming a guitar. The initial mood matched his laidback attire: a flannel shirt, cowboy hat and jeans. Regardless, I have to hand it to him. On almost every song, Keith played an acoustic or acoustic-electric guitar. Many audience members commented on Keith’s stellar voice after over 20 years in the music industry and his continuous guitar playing. When Keith paid tribute to country legend and friend Merle Haggard, who died in 2016, the concert took off. Keith blended some of Haggard’s greatest hits, including “Okie from Muskogee” and “Silver Wings,” into a cohesive medley. Once Keith got in the groove, the performances were electric — well, as electric as a country concert can be. Both Keith and the audience enjoyed “Red Solo Cup,” a 2011 song whose instant popularity on the web took Keith by surprise, he said. Most of the attendees — including myself — knew every word of the track and this put a Texas-sized smile on Keith’s face. The drawl with which he performed his lyrics added to relaxing summer atmosphere. When Keith sang “I Love This Bar,” it was easy to imagine a dark room filled with the sound of pools balls clacking against one another and unsavory conversations between bar patrons. It was difficult to believe I was not hearing Keith’s voice through my radio. My mom and I often jammed to the song during my high school years and the live performance exceeded my expectations. His Nugent cover showcased an unexpected side of Keith. He proved he could deliver a rock song with impressive vocal technique. Just as Keith had promised earlier, the band was able to cut across genres with ease. After much suspense leading up to Keith’s short encore, he ended the night with an emotional thank you to military veterans, inviting them to stand alongside him as he sang a beautiful performance of “American Soldier,” leaving many in tears. The performance was made that much more powerful as Keith played an American flag guitar. Published: Aug. 4, 2017, 1:52 p.m.